Aren’t they so cute! 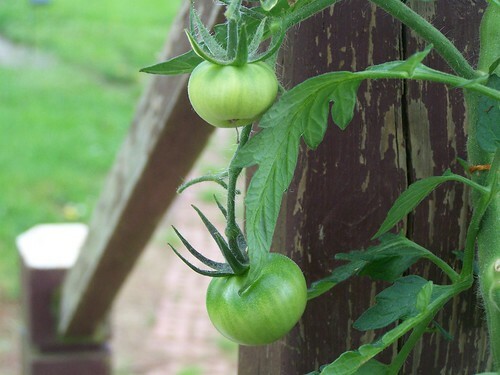 �These little guys are on the big tomato plant we bought. �Makes my mouth water just looking at them. �Today has been dry at least. �No rain. �We were able to hang clothes on the line. �YEAH! We received a wonderful blessing yesterday. �Billy gave us a quarter of a beef. �You will notice on my canning log a new entry. �Thank you, Lord. �My computer is out of commission-so sad. �Dave says he thinks it is the hard drive. �I will be using Hubby’s computer for a while. �I miss my computer already. �Hopefully, we will be able to get it fixed before too long. Time to take one of the canners off. �Enjoy your day and God bless. Those look so good. What a blessing to get some beef. Did you can the meat in chunks? Did you can some ground beef last year? Hi Donna.. What a wonderful blessing to be given the beef… I am wondering why you would can it instead of freezing.. Is it better?